The Danis save deemed worthy by the NHL was a shoulder-shrug save on a one-timer after an islander takeaway turned into a giveaway. Not bad. But that's the 3rd period, and the Bruins did the same thing I did: Think ahead too far. The first period has not a whole lot going on for it. The second period, 3+ minutes in, and Savard gets into the zone. He slaps it from the halfboards, but Danis isn't letting that beat him. So it bounces off to the blueline. Luckily, a team of intrepid zone-keepers are in the area. Stuart clears it back in, and Savard picks it up behind the net. Savard looks left looks right goes left shoots right and roofs it shortside on Danis. GOAL! 1-0. Milbury and Tappen spend the next 5 minutes seeing who can say "Gretzky's Office" more times. Shawn Thornton fights Tim Jackman, lands one hit and then they wrestle to the ground. HockeyFights.com says: Draw. Third period. The Bruins are playing with fire by phoning it in like this. 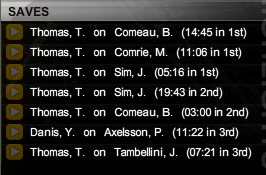 Luckily, Thomas has been making saves left and right. And then, like a beam of light peaking through the clouds on a rainy day, Thomas clears from behind his net all the way out to Sobotka in the neutral zone. Vlad slaps it in as soon as he gets in the zone, but misses completely. Luckily, this is all a cunning plan. From center ice, Martin St. Pierre (generously listed as 5'9") reaches his league-maximum stick over and taps it in behind Danis. GOAL! 2-0. Martin St. Pierre just scored his 2nd NHL goal! Somebody needs to get him, Pedroia, and Chara in a picture together. 1 minute left, mr. Danis has left the crease and the Islanders are trying to get something going with 6 attackers. The Bruins almost clear it but the Islanders manage to keep it in the zone. Bill Guerin takes it behind the net and puts it in front of the net. It goes off a skate or something. 2-1. Thomas looks surprised. He should know from bear hunting that you can't consider it dead before it's over. He was really hoping to get on the top stats list for shutouts, too. The Instigators is hilarious. Also, I've finally figured out that they're just in a bluescreen studio and HAVE NO DESK. Which is more hilarious. Sens Army Blog has mailed Mr. Chara a letter congratulating him on his GWG against the Habs the other night. NO HABS NO! I support this campaign. That's not a real desk? ?